Swollen fingers that look like plump sausages can be painful and leave your fine motor skills something to be desired. When you exercise and experience finger and hand swelling, you may be uncomfortable physically but can be comforted in the fact that you are not alone. Fingers that swell during physical activity are common and rarely cause for alarm. Several of the causes of finger swelling during exercise are widespread and can affect almost anyone. The act of exercising increases your blood flow and body temperature. To accommodate these changes, your blood vessels dilate to cool you off. During the process of dilation, your fingers and hands may swell up, particularly if you sweat a lot when you work out. Another form of swelling that occurs during exercise can be the result of tendinitis, the inflammation of the tendons around a joint. Hand tendinitis can create swelling around your fingers and wrist and is most likely if you are an avid weightlifter. 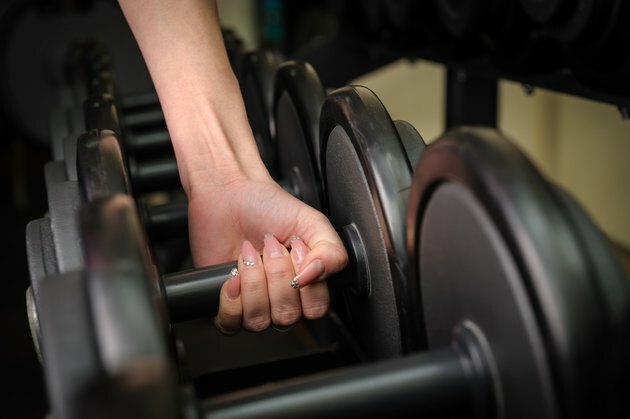 The repetitive motions you use to lift weights can put a strain on your wrists and fingers. A more rare medical condition involving the swelling of the fingers during physical activity is called hyponatremia, a situation in which your body has a lower-than-normal sodium level. Hard-core athletes like marathoners who perform high mileage on a daily basis and drink large volumes of water are among the small population who are likely to develop hyponatremia. The excessive amounts of water can dilute your body's natural sodium level, throwing off your balance of electrolytes. Hand swelling, mental confusion and vomiting are all signs of hyponatremia; the condition must be treated immediately to prevent possible complications such as brain damage and coma. Some of the causes of exercise-induced finger swelling do not need to be treated and will resolve themselves as your blood circulation and body temperature return to normal after a workout. Tendinitis symptoms that include swollen fingers can be treated with icing and rest, which may mean choosing another type of workout until your pain and inflammation subsides. Hyponatremia is treated by a medical professional and includes the administration of intravenous fluids and medications to regulate your sodium levels. Treatment for swollen fingers varies according to the root cause, but several of the problems can be remedied with hand exercises. Swelling in the hands that results from breast surgery, called lymphedema is not necessarily related to exercise itself, but can be helped by physical activity because the movement of the hand and fingers pushes excess fluids out of the extremities. The same can be beneficial to those who experience the common swelling of the fingers due to perspiration and blood vessel dilation. Hand squeezes, an exercise that you perform by squeezing a ball or hand gripper, also strengthens the muscles of your hand to improve and guard against tendinitis. Why Do My Fingers Swell When I Run?